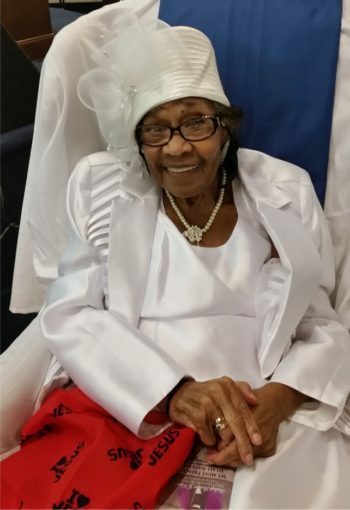 One hundred year old Mother Theresa Elizabeth Bolden, State Supervisor of Women for Eastern Missouri First Jurisdiction (EMFJ), requested to be placed in emeritus status beginning February 1, 2018. Mother Bolden is the oldest and longest reigning of all the State Supervisors. The centenarian served nearly thirty seven years in the highly respected position in the St. Louis region. She was appointed by the late Mother Mattie McGlothen after the recommendation of the late Bishop William E. Turner. Representing all the COGIC centenarians, the ever graceful Mother Bolden was most recently recognized by the General Assembly at the November 2017 International Convocation. Mother Bolden’s position will be filled by State Mother Josephine Gale Boyd who was elected by the credential holding women of EMFJ and subsequently approved by Jurisdictional Bishop R.J. Ward. Mother Boyd will be officially appointed at the 111th International Holy Convocation by Mother Barbara McCoo Lewis.